Looks like we should alljump in our time machines then! Also says available from Maplin through Amazon for £49.99 on the same page. You can get it for £49.99 on Amazon, if you select the Maplin seller. Just wont be next day delivery. Needed 7 drivers and a few extensions for the kitchen last week, but most lengths required were way shorter than 2m. Have about 4m worth of cut offs but only way to reuse them involves soldering. Paid £59.99, will see if Amazon will give me the difference back without having to reorder. It's £50 back. Great price.Needed 7 drivers and a few extensions for the kitchen last …Great price.Needed 7 drivers and a few extensions for the kitchen last week, but most lengths required were way shorter than 2m. Have about 4m worth of cut offs but only way to reuse them involves soldering.Paid £59.99, will see if Amazon will give me the difference back without having to reorder. It's £50 back. They are expensive, but Litcessory sell a range of Hue connectors on Amazon. I have used the Cat5 extension and it does the job. They are expensive, but Litcessory sell a range of Hue connectors on …They are expensive, but Litcessory sell a range of Hue connectors on Amazon. I have used the Cat5 extension and it does the job. Want to sell me the off cuts? I’m 40cm short on 3 strips! Lol. Yeah I revived my stupid amount of lights today as well. The strips are incredibly bright. 40cm short on each strip? You near Belper? No - about 47 miles away near Manchester! If there no good to you I’ll pay for the postage and your time? This should fit a 55 inch TV, shouldn't it? Also, can these be modified in any way to work like a Philips Ambilight? Can this be used for the cut offs? Or just full length strips? Hue stuff is almost certainly going to be on sale again tomorrow for Cyber Monday. 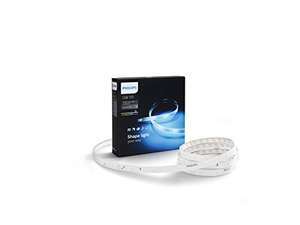 Might be worth holding out as the strips were £99 a pair with 4 spotlights included as well on Black Friday. This should fit a 55 inch TV, shouldn't it? Also, can these be modified …This should fit a 55 inch TV, shouldn't it? Also, can these be modified in any way to work like a Philips Ambilight? If your TV has ambilight and you have a hue bridge yes you can. It doesn't have ambilight, have a Samsung. Thought you could use this strip and a raspberry pi to rig up something that works like an Ambilight. Do have a Philips Hue bridge though since I own some lights. It doesn't have ambilight, have a Samsung. Thought you could use this …It doesn't have ambilight, have a Samsung. Thought you could use this strip and a raspberry pi to rig up something that works like an Ambilight. Philips Lighting announced today plans for Philips Hue Entertainment, a software update that takes home entertainment to a new level by synchronizing Philips Hue lights with movies, gaming and music content (including streamed content), provided in close collaboration with the entertainment industry. The new feature follows successful entertainment pilots with The Voice, Syfy and Live Nation. 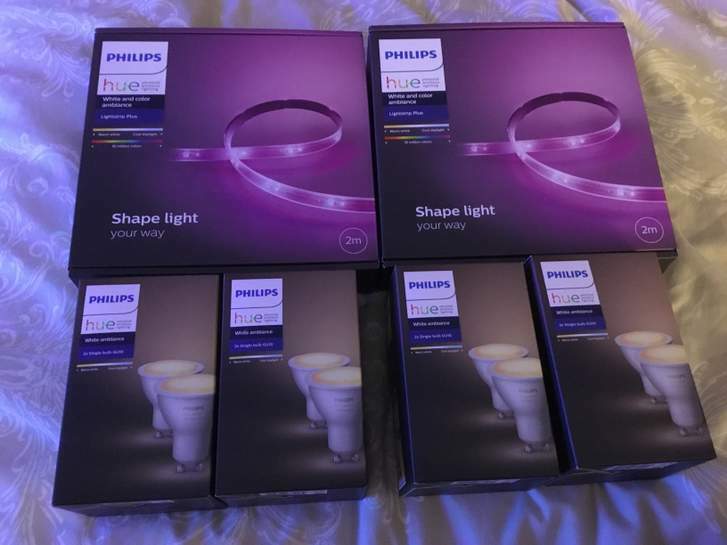 Philips Hue customers will have access to it in December through a free over-the-air update for all existing Philips Hue V2 bridges and all Philips Hue color-capable lights. On the top left there is an Installation Guide for the products. Was that a black Friday offer? Missed that one!! Is this the same at Maplin for £49.99 plus £5 voucher? I must have missed this on Friday. Is this likely going to be on sale again tomorrow? I must have missed this on Friday. Is this likely going to be on sale …I must have missed this on Friday. Is this likely going to be on sale again tomorrow? Could be doubtful as Amazon Black Friday ends at midnight. I suppose Cyber Monday could be a completely different thing under a different name and they do it. Hue stuff is almost certainly going to be on sale again tomorrow for Cyber …Hue stuff is almost certainly going to be on sale again tomorrow for Cyber Monday.Might be worth holding out as the strips were £99 a pair with 4 spotlights included as well on Black Friday. Nice one, Glad to hear it. I've got this kit on the way too (along with two of the 3x E27 & Hub kits). Sucker for a good deal! I was a little reluctant with the strips as the side by side comparisons with the LIFX strips show them to be nowhere near as bright due to having less LEDs. But glad to hear they impressed you. Errr I dont think I claimed anything did I? It doesn't have ambilight, have a Samsung. Thought you could use this …It doesn't have ambilight, have a Samsung. Thought you could use this strip and a raspberry pi to rig up something that works like an Ambilight. Do have a Philips Hue bridge though since I own some lights. You're right you can but I'm not into those. Had a Philips TV with 2 sides Ambilight and own a bridge so the only option for me was the Lightstrip.